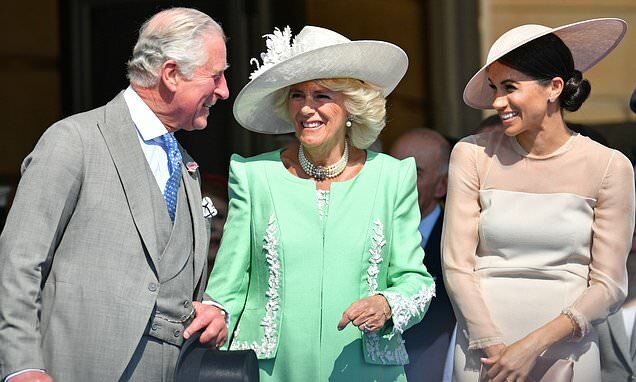 She's impressed the Queen with her 'stamina' by taking on a royal tour while heavily pregnant, and it seems the Duchess of Sussex has also won over her father-in-law Prince Charles since joining the royal family. Prince Charles, 70, and Meghan Markle, 37, share a 'close bond', a royal insider told The Telegraph, which has grown since the former Suits actress married Prince Harry in May last year, thanks to their shared interest in history, art and culture. According to the source, Charles has been acting as Meghan's 'mentor' by educating her on royal and constitutional history. 'The Duchess has shown a genuine interest in learning more about the history of the family she has married into, and her father-in-law has been delighted to impart his knowledge,' the explained. Meghan and Charles will be seen together today at a lunch reception hosted by the Queen to mark 50 years since Charles' investiture as the Prince of Wales. Insiders have also suggested that Meghan has helped to improve the relationship with Charles and Harry, after experiencing her own rift with her father Thomas Markle.